Aim: Preliminary investigation on the ground and aerial photography of all the sites. Funded by: the Phyllis and Eileen Gibbs Travelling Fellowship (Newnham College, Cambridge), the American University in Cairo, the Seven Pillars of Wisdom, Churchill College (Cambridge). The Team: Dr Corinna Rossi (co-director, military architecture), Dr Salima Ikram (co-director, human and animal remains); Amanda Dunsmore (ceramicist), Richard Knisely-Marpole (chief surveyor), Nicholas Warner (architect, domestic architecture), Matt Wetherbee (surveying assistant). The team was assisted on the field by Mahmoud Mahdi, Inspector and Saad Fuad, desert guide, and was assisted and supported by Ibrahim Bahgat, Chief Inspector. Aim: Theodolite survey of the archaeological remains of Ain Gib, Qasr el-Sumayra and Maghatta. Funded by: the American University in Cairo, the Thomas Mulvey Fund (Cambridge), the Seven Pillars of Wisdom, Churchill College (Cambridge), Silva UK. Approved and supported by the Royal Geographical Society (with the Institute of the British Geographers). The Team: Dr Salima Ikram (co-director, human and animal remains), Dr Corinna Rossi (co-director, military architecture), Dr Alan Clapham (archaeobotanist), Amanda Dunsmore (ceramicist), Richard and Angela Knisely-Marpole (chief surveyors), Dr Alan Rowe (routes and ethnography), Ilka Schacht (hydraulic specialist), Nicholas Warner (architect, domestic architecture); Leslie Warden, Katherine Bandy, Hala Said and Hiroki Ishiyama (surveying assistants). The team was assisted on the field by Mahmoud Mahdi, Inspector and Mustapha Abd el-Sattar, Policeman, and was assisted and supported by Ibrahim Bahgat, Chief Inspector. Aim: Theodolite survey of the archaeological remains of Umm el-Dabadib. Funded by: National Geographic, The McDonald Institute for Archaeological Research (Cambridge), the American University in Cairo, the Thomas Mulvey Fund (Cambridge), the Seven Pillars of Wisdom, Churchill College (Cambridge). The Team: Dr Corinna Rossi (co-director, military architecture), Dr Salima Ikram (co-director, human and animal remains), Dr Alan Clapham (archaeobotanist), Nicholas Warner (domestic and religious architecture), Amanda Dunsmore (chief ceramicist), Dr Alison Gascoigne (ceramicist), Richard and Angela Knisely-Marpole (chief surveyors); Kathryn Bandy and Leslie Warden assisted Dr Ikram and the ceramicists, and Jessica Angell, Yukiko Sasada, Lucy Jones, and Melissa Jeuck carried out the theodolite survey under the direction of Richard and Angela Knisely-Marpole. Support was generously offered by Saad Fouad, and Omar Abd es-Salam (policeman). The Pan Arab drivers and camping team (Hamdi, Mahmud, Esam, Osama, Mustafa, Saleh and the cook Rasmi) were key to the success of this project. 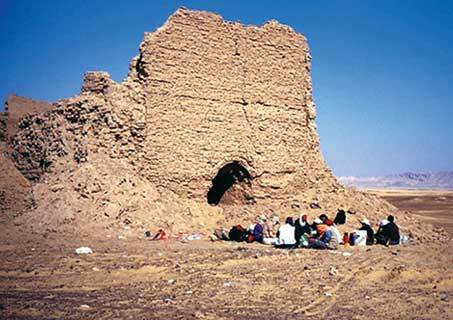 Aim: Theodolite survey of Ain Tarakwa and Ain Dabashiya and exploration of the Darb Ain Amur. Funded by: National Geographic, the McDonald Institute for Archaeological Research (Cambridge), the American University in Cairo. The team: the directors Salima Ikram (Egyptologist, specialist in human and animal remains) and Corinna Rossi (architect), Kathryn Bandy (Egyptologist, surveyor), Alan Clapham (archaeobotanist), Eugene Cruz-Uribe (Egyptologist), Amanda Dunsmore (ceramicist), Menatallah Eldorry (surveyor), Christine End (artist, surveyor), Alison Gascoigne (ceramicist), Monica Hanna (surveyor), Tomek Herbich (magnetometry survey), Richard and Angela Knisely-Marpole (chief surveyors), Emmy Malek (surveyor), Nikolaos Lazarides (surveyor, Egyptologist), Hironao Onishi (Egyptologist, surveyor), Leslie Warden (Egyptologist, surveyor), Nicholas Warner (architect) and Ragheb Abdel Hameed Khalaf Allah (inspector). 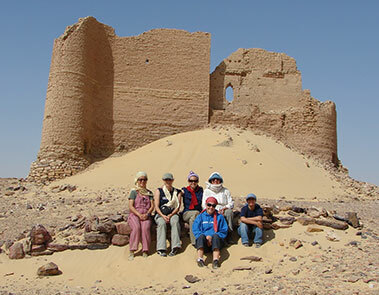 Transportation and logistic support for the exploration of the Darb Ain Amur was provided by Pan Arab Tours. Funded by: The Antiquities Endowment Fund of the American Research Center in Cairo. Funded by: The Antiquities Endowment Fund of the American Research Center in Cairo and Private Donors. The team: Arto Belekdanian (Egyptologist, surveyor), Craig Boyer (surveyor, technical support), Pieter Collet (draftsman), Alison Gascoigne (ceramicist), Salima Ikram (Co-director, Egyptologist), Leslie Warden (ceramics assistant), Nicholas Warner (architect, surveyor) and Inspector Jamal Abu Bakr Abdel Mejid Ali. External consultants: Alan Clapham (archaeobotanist), Pamela Rose (ceramicist), Corinna Rossi (co-director, Egyptologist). 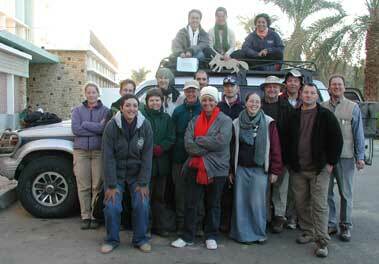 Corinna Rossi (director), Ann Foster (surveyor), MennatAllah el-Dorry (surveyor and archaeobotanist), Stephanie Boucher (surveyor), Julie Patenaude (surveyor), Louise Bertini (surveyor and bone specialist), Saiyed Yamani (SCA Inspector), Omar Abd es-Salam (policeman), PAT drivers: Abd el-Aziz (‘Zizou’), Ayman, Hisham. The Team: Salima Ikram (director), Nicholas Warner (artist, architect), Pieter Collet (artist), Craig Boyer (surveyor, coptologist), Nicholaos Lazaridis (philologist), Leslie Warden (ceramicist), Pamela Rose (ceramicist) and Inspector Mohammed Ibrahim Ahmed Ali.